It’s never easy. If it were it wouldn’t be special. Magical. 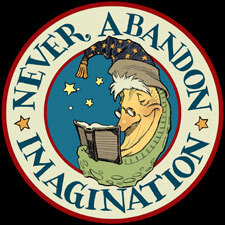 Everyone has dreams – BIG dreams, little dreams, secret dreams – but we don’t always act upon them. Maybe it’s because we believe can’t change our life. Our destiny. But perhaps we can. I’m one of those who was (and still is) proud enough and foolish enough to go after my dreams. Why not? You never know what ones might just actually come true. In the spring of 1992, after graduating from the Art Institute of Fort Lauderdale, I found myself living back home with my parents. 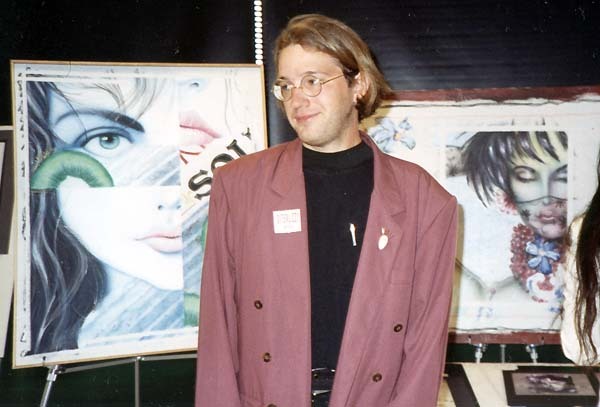 I had a diploma, a bunch of half-used art supplies and a vision of myself working as a professional illustrator. Though I longed to become a children’s book author and artist, none of my submissions to the big publishing houses had received a response. No response meant that dream had to wait. It also meant no big advance on a book deal, so I kept my day job. I worked for an organization that owned a lot of real estate down in south Florida. There, I created maps and pamphlets for land parcels that would eventually be developed into shopping malls and beachfront condominiums. Not exactly the dream job for this aspiring illustrator, but at least it helped pay off my school loans. One weekend I was having drinks with some old friends at a local Irish pub and the subject of Dungeons & Dragons came up. 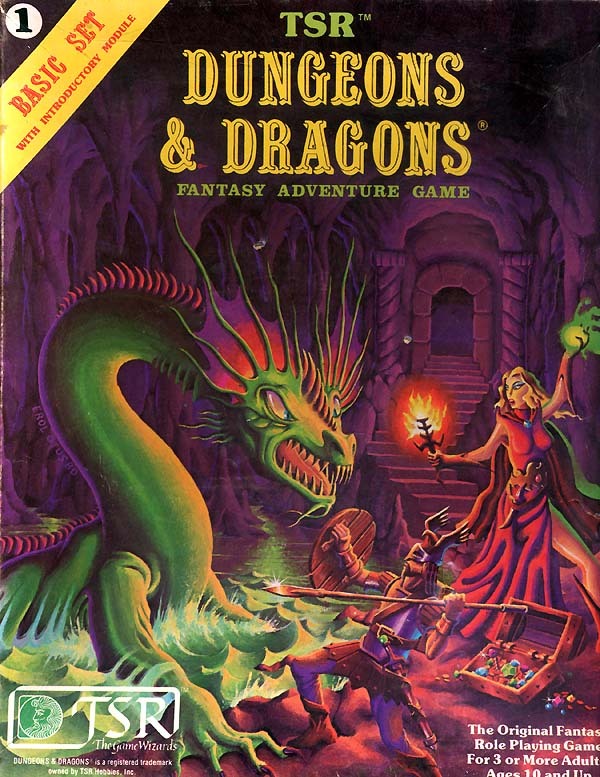 Everyone at the bar reminisced of epic late-night D&D adventures from a time when life’s pleasures consisted of comic books, Mountain Dew and MTV. We agreed to play the following evening and I was excited to embark on the new adventure. The next day I was rummaging through a box of old books from the back of my bedroom closet. I found a faded felt Crown Royal bag full of green dice and a slim box holding painted lead miniatures. 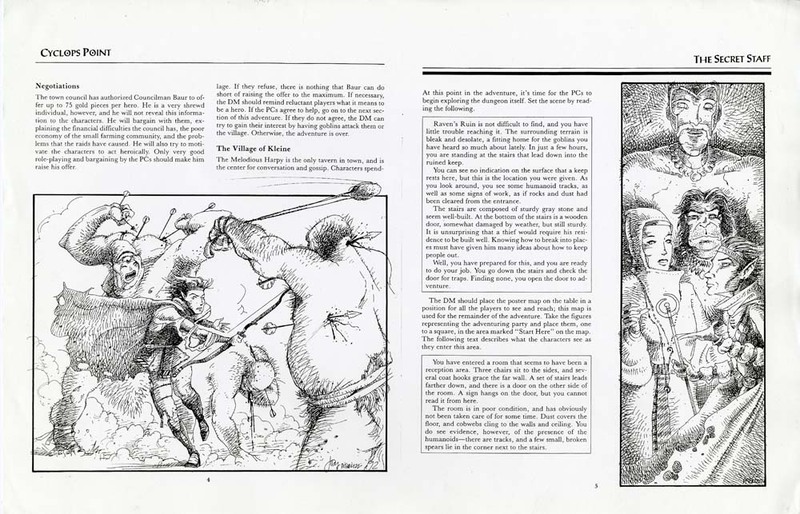 At last, I dug out my dusty dog-eared copies of the AD&D rulebooks – but quickly realized I was missing one. 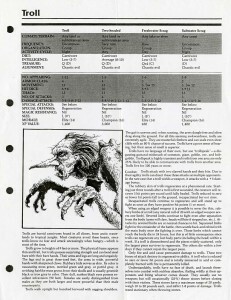 And it was my coveted favorite, my precious: The Advanced Dungeons & Dragons Monster Manual. No problem, I thought as I hopped in my sun-bleached ‘83 Honda and drove off to the bookstore to purchase a new copy. As the store clerk located the book and handed it to me, I realized something had changed in the years since I had played my totally radical version of D&D in the 80’s. 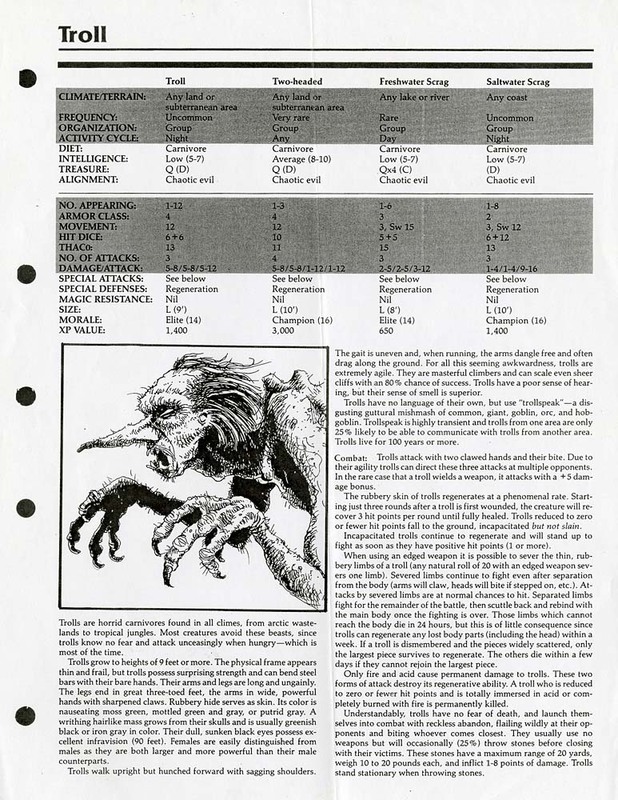 The slim easy-to-sneak-to-school AD&D Monster Manual had been replaced by a bulky 3-ring Monstrous Compendium that looked like an inter-office memo on monsters…and bored flabby ink blob monsters at that. 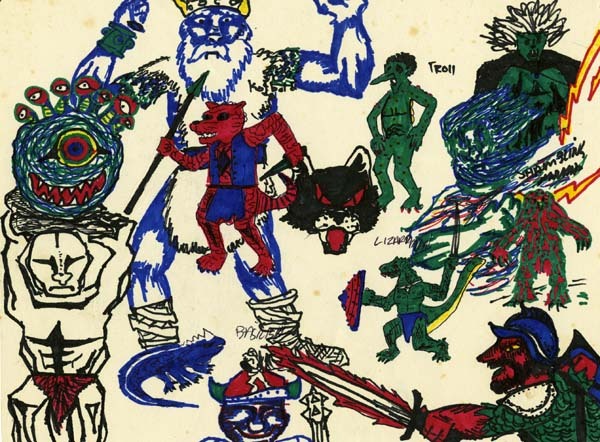 Gone were the heavy-lined tattoo graphics of David Trampier and the drawn-on-my-notebook scrawls of David Sutherland. 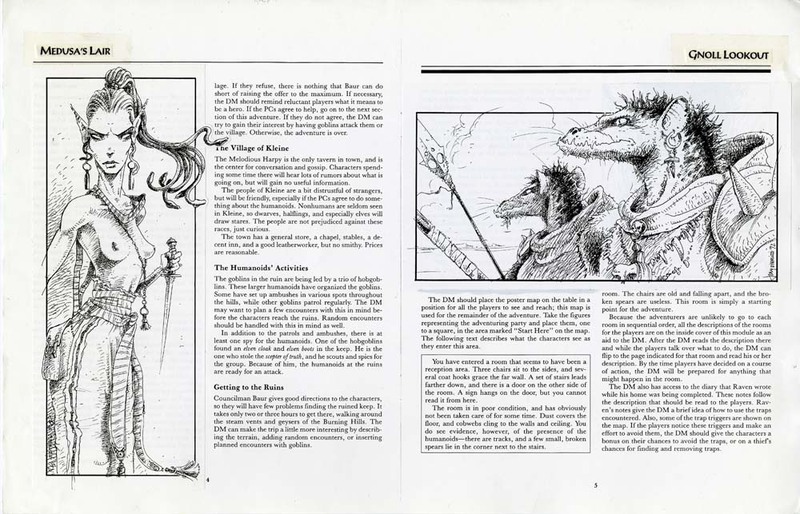 Sure, the one-sheet pages in the AD&D 2nd Edition Monstrous Compendium may have been easy to use, but the images of the monsters all lacked their spark, their vis vitae, that got my imagination spinning like a 20-sider when I saw them as a kid. “I bet you could do art for these guys,” Mike said in a laid back drawl that evening as he paged through the Monstrous inter-office memo. Mike was known as The Most Powerful Dungeon Master in Palm Beach County. He had long eggplant-tinted hair like Anthony Kiedis of the Red Hot Chili Peppers. He wore black clothes and was adorned in rock-n-roll jewelry because he was the lead singer in a local rock band. And he was my good friend. “They gonna love your stuff, boy yee!” his old schoolmate, Mike D, added in this funny sorta-rapper-speak that he would use. Mike D was ex-military. He always had a buzz cut. He always played a paladin. Always. He was training to become a police officer. “I’d help you,” my brother, Adam, said. He was a skinny tween version of me complete with an oversized head and thick glasses. 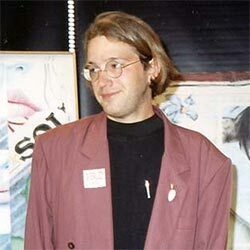 He was into the comic books artists of the day like Todd McFarlane, Arthur Adams and Jim Lee. To him, D&D was a crappy cartoon with an old guy, some bratty kids and a baby unicorn. Back home, after recovering from our 6 PM-to-6 AM game session, my brother and I sketched some of our favorite monsters at the kitchen table. Now, I’d gone to art school for five years. 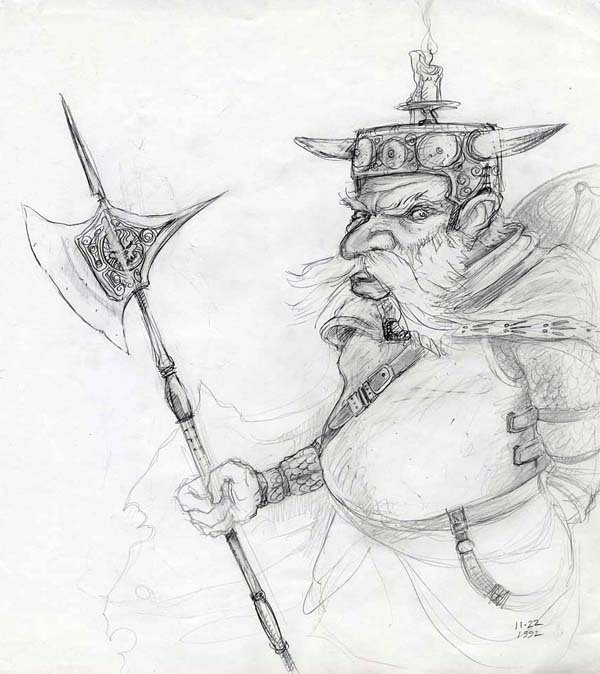 I had experimented in oils emulating Frank Frazetta, dabbled in acrylics just like Michael Whelan and sketched in watercolors like Brian Froud. I learned that I was somewhat adept at all of these mediums. 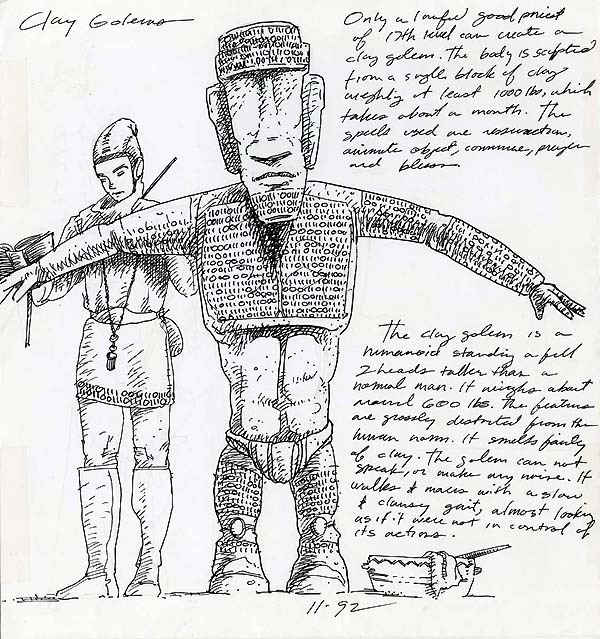 And yet, I used a drugstore-bought Uni-ball pen and bond paper to render my beholders and bulettes. I am not sure why I disregarded all of the mediums I had discovered though school in favor of a ballpoint pen. Perhaps it was simply because it was comfortable. With a pen and paper there was no pressure to create a masterpiece – just a wander back into familiar territory. 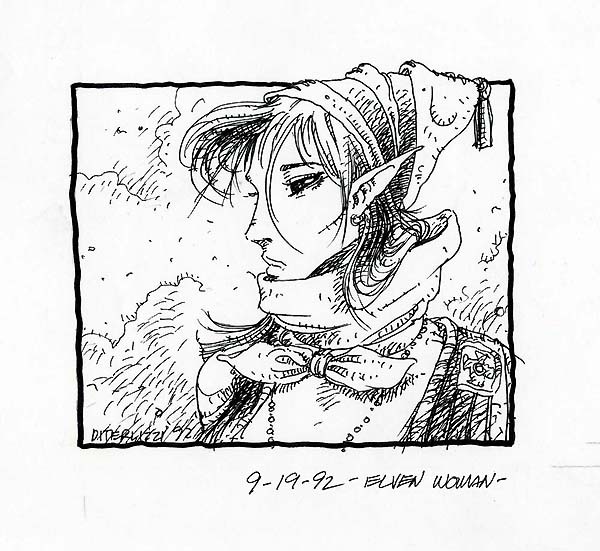 I say familiar because I had drawn these subjects many times, years ago when my parents handed me a purple box with a lime-green dragon on the cover facing off with Day-Glo attired adventurers. I was 12 when I received my copy of the Dungeons & Dragons Basic Set. 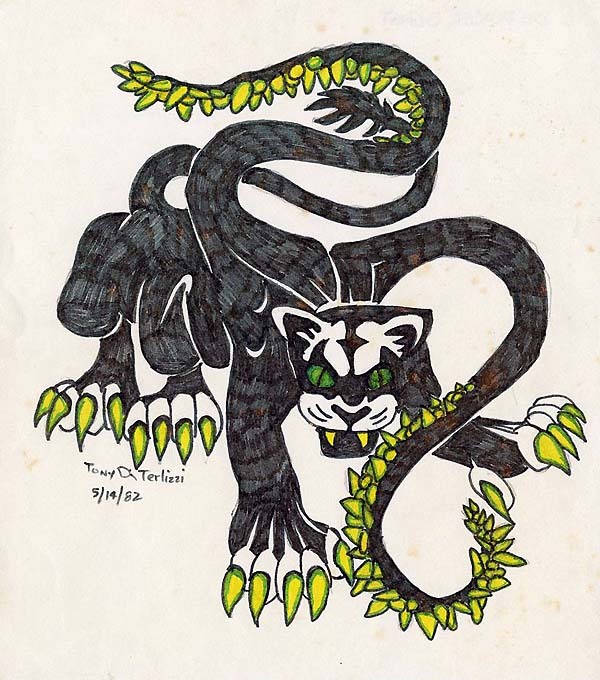 Back then I would copy the ink drawings of mythical monsters by the likes of Jeff Dee and Erol Otus. Now, I was reinterpreting those classical creatures in my own style. Could I actually illustrate for the company that had inspired me way back when? It would be an amazing job. A dream job. And I would get paid to do it. But why weren’t those artists working for them any longer? Was I even good enough to take rank alongside them? Who the heck did I think I was? Throughout the week I sketched every chance I got – during work, after work, late at night. By the time I met up again with my friends on gaming night I had a pile of drawings to show them for feedback. My friends encouraged me to continue on with my art submission. In between dice rolling, miniature painting and paying the Domino’s pizza delivery boy, they offered up their thoughts and ideas as to what I should draw next. I felt like my life held the same possibilities as the adventure module we were playing. I had some artistic skills that I had honed over the years. I also had an excellent party of friends to support my venture. Now all I needed was a little luck. By September, I had put together a small portfolio of my best samples. 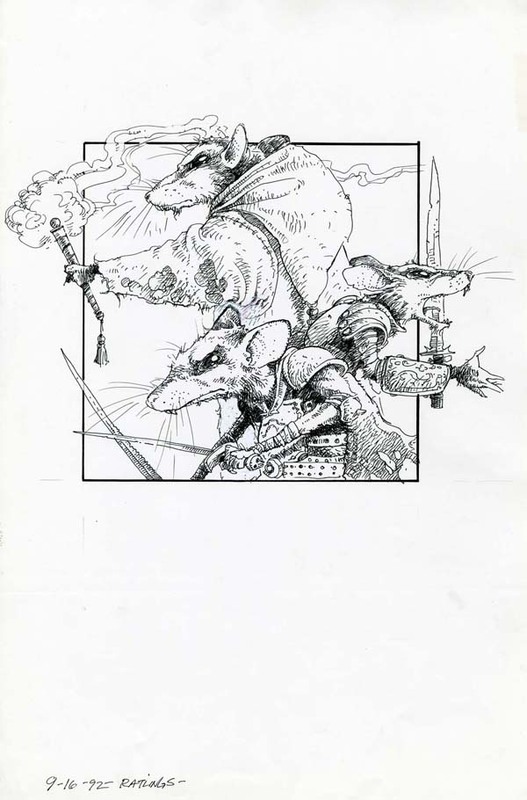 I Xeroxed pages from a module and pasted my artwork inside so the art director at TSR (fine publishers of all things D&D) could see what my work would look like in their gaming books. When the prints slid out of the copier a weird feeling came over me. A month rolled by. No word from the great and powerful TSR. During game night I tried to forget that I sent off the samples altogether. When my friends asked if I’d heard anything I sheepishly shrugged and hid my worry behind my player-character sheet. Finally, in mid-October I received a letter response from Peggy Cooper, Art Director for TSR. She wrote that I had “a unique and interesting drawing style but it wasn’t enough to hire me as a freelance illustrator.” The letter closed with encouragement to submit more samples in the future for their files. It was a rejection. I was crestfallen. I wasn’t good enough. I envisioned a very real future with me designing maps of south Florida real estate and development for the remainder of my life. But my friends saw it another way. “Dat’s right boy!” Mike D squeaked in his rapperspeak. “If you get this gig, it will be the coolest job ever!” He was rolling up a new paladin since his character had been burned to a crisp by a juvenile dragon. His new character, of course, was the brother of the slain victim. Therefore; this character knew every detail about the adventure and rushed to join our party. But I didn’t know what was wrong with my samples. I didn’t know what to fix or what would make my submission more successful. The following Monday, with trembling hands, I dialed the main number for TSR. I hung up before anyone could answer. “Oh, hi Tony! Nice to hear from you, your art samples were really nice. A few of us here in the office took a real liking to them,” she said. I shared the news with my gaming group that weekend. “You can do it, homie!” Mike D slapped my back. “It’s gonna be so sweet when you’re working for them. We are all gonna get freebies, baby!” He started dancing around the gaming table. In the shiny plastic of a 2-liter bottle of Cherry Coke I saw my reflection. I looked like a halfling cornered by a hill giant. Make the characters as cool as the monsters themselves. My furrowed face relaxed. Mike was right. He really was The Most Powerful Dungeon Master in Palm Beach County. I sketched out the best player characters I could dream up. I conjured them from the spirit of Arthur Rackham, Rankin & Bass’ animated version of The Hobbit and the old Dragon’s Lair video game. I sent in my next batch of drawings at the end of the month, just as Peggy had asked. And do you know what? Rejected. Again. Peggy said the characters were designed well, but they were not active enough. Within a couple of weeks I had new finished drawing samples sent up to her. This time, I created scenarios that were both narrative and entertaining. Instead of neat monsters and cool characters, I tried to illustrate elements and rules of the game. This was an aspect that I thought new gamers (like my brother) would like and it would remind older players of why they enjoyed D&D in the first place. That December, Peggy offered me my first freelance job illustrating an entire boxed set adventure for TSR, titled Dragon Mountain. 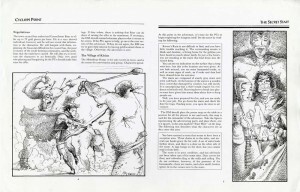 The following spring, I illustrated over 100 illustrations of the first ever color edition of the AD&D Monstrous Manual. 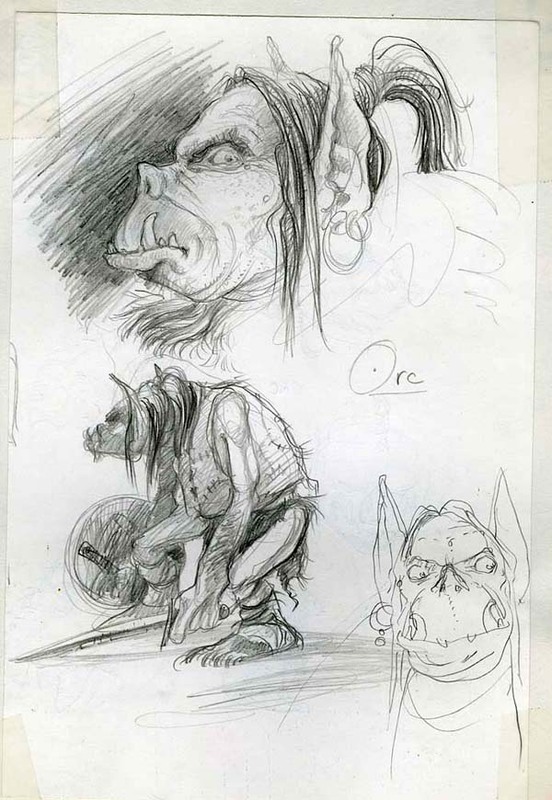 After that was completed I went up and visited the folks at TSR and was invited to be the sole illustrator on a new role-playing line they were creating called Planescape…but that’s another story. I never forgot about the support my friends gave me when I started out. 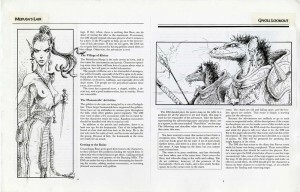 In fact, when I illustrated the entire Planescape Monstrous Compendium in 1994, I acknowledged them in the front matter – a first for TSR publishing. Like I said, it’s never easy. But sometimes all you need is a little faith from your friends and family, and especially in yourself, to make your dreams come true. Keep drawing. Keep dreaming. Happy Holidays.